Whether first year students or Hilltop lifers, the positive impact of a Hilltop Country Day School education was clear during speeches by the graduating fourth graders at the Lower School Closing Ceremony on June 8. Parents, grandparents, siblings and friends gathered on the campus to cheer and celebrate as the Class of 2021 officially “moved up” to the Upper School as fifth graders. In addition to celebrating the fourth grade graduates, several end of year awards were bestowed on students. The perfect attendance award was given to Kindergartner Sophia Diaz of Sparta; Third Grader Elizabeth Diaz of Sparta; Third Grader Henry Gibson of Blairstown; Fourth Grader Aroosh Patel of Sparta; Third Grader Kunsh Patel of Sparta; Fourth Grader Preston Pirrello of Sparta; and Third Grader Logan Turner of Sparta. A representative from each grade was recognized with the Junior Hawk Spirit Award. The Junior Hawk Spirit Award is given to students who in the estimation of the faculty, best exemplify outstanding school spirit and consistently demonstrate the qualities of friendship, cooperation and genuine excitement for Hilltop. This year’s winners of the Junior Hawk Spirit Award are First Grader Cameron Clifford of Sparta; Second Grader Rupa Pasunuri of Sparta; Third Grader Logan Turner of Sparta; and Fourth Grader William Antunes of Sparta. Hilltop is guided by four cornerstone values: Honesty, Respect, Responsibility, and Kindness. The Core Values Award is given to students who in the estimation of the faculty, best exemplify “consideration of the Hilltop community” and consistently demonstrate the qualities of honesty, respect, responsibility and kindness. This year’s winners are First Grader Matthew Sincaglia of Newton; Second Grader Christian Pascual of Lake Hopatcong; Third Grader Sophie Schaeffner of Lafayette; and Fourth Grader Aroosh Patel of Sparta. The Green Knight Environmental Award is given to a fourth grader who exhibits sound ecological practices, understands current conservation movements, demonstrates a serious attitude towards environmental studies and shows environmental responsibility in their own life. The recipient of this year’s Green Knight Environmental Award is Taylor Ashworth of Andover. In addition, each grade level passed on its responsibilities to the rising students. Taylor Ashworth presented the American Flag to Third Grader Emily Bliss for the job of raising and lowering the flag each day; Third Grader Elise Easter presented a composting bin to Second Grader Kelsey Chamberlain to symbolize managing the composting at lunch each day; Second Grader Sergey Gekht presented a globe to First Grader Cayden Tucker to represent the job of educating the student body about different types of recycling; and First Grader Mary Gaffney presented the Attendance Basket to Kindergartner Kaylee Rogers to hand over the job of collecting the morning attendance. 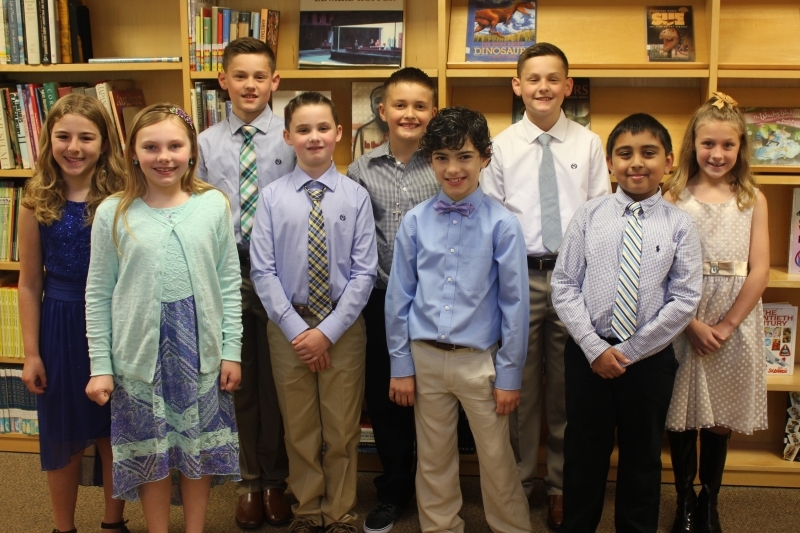 Hilltop congratulates the Class of 2021: Alison Bliss of Andover; Taylor Ashworth of Andover; Justin Arapkiles of Andover; Eamon Coletta of Sparta; Preston Pirrello of Sparta; William Antunes of Sparta; Ryan Arapkiles of Andover; Aroosh Patel of Sparta; and Annika Chamberlain of Long Valley.